Cessation of hostilities terms exclude ISIS and other Security Council named terrorist groups. War continues to eliminate them, Palmyra’s liberation the most important battlefield success so far. Spurious media and other misreporting claim Syrian and Russian ceasefire violations. The London-based, Western financed, misnamed Syrian Observatory for Human Rights (SOHR) reports propaganda, not hard truths. Russian photographic evidence shows airstrikes it makes solely strike terrorist targets, scrupulously avoiding civilian ones – polar opposite how America operates, massacring noncombatants indiscriminately in all its wars, committing high crimes against peace unaccountably. SOHR willfully and maliciously lied, claiming it “document(ed)” Russian warplanes killing “5081 civilian(s)…(nonexistent moderate) rebel(s)” and fighters from other “Islamic Factions,” saying noncombatants comprised 40% of the casualties. It turned truth on its head, saying Russian and Syrian airstrikes continue killing civilians. The New York Times called excluding ISIS and other UN designated terrorist groups a “gaping loophole,” letting Russia continue to bomb (nonexistent) moderate rebels. The US/Saudi backed so-called High Negotiations Committee (composed of terrorist groups) accused Russia and Syria of bombing “rebel” positions in Aleppo province, Idlib, Hama, Damascus, Homs, Quneitra, Daraa and elsewhere. On April 1, the State Department lied, claiming Syrian warplanes bombed a school and hospital near Damascus, killing over 30 civilians, including 12 children. Virtually nothing in the West is reported about multiple daily “rebel” violations. Damascus and Moscow strictly observe ceasefire terms, solely attacking armed elements waging war on the people of Syria. Russia explained attacks only continue against ISIS and other Security Council designated terrorist groups. It monitors ceasefire breaches, naming culpable anti-government forces responsible. Since cessation of hostilities began at midnight February 26, Moscow confirmed multiple daily violations by so-called “rebel” groups. 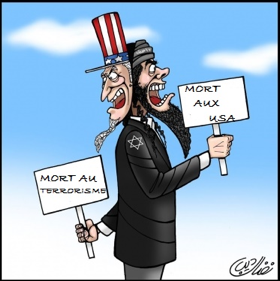 US supported “moderate” fighters are cold-blooded killers. Restoring peace requires eliminating them militarily. Diplomatic conflict resolution is unattainable. Washington wants war, not peace, continuing to recruit, arm, fund and train anti-government death squads. Preserving Syria’s sovereignty and territorial integrity require eliminating the threat they pose.